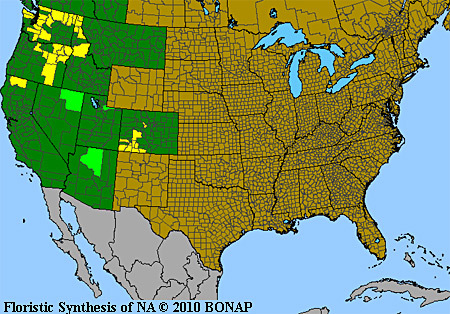 Click to read about the Botrychium genus and to find links to more information about Botrychiums. Molas Pass (near Silverton), September 28, 2010. The above photographs give some idea of the difficulty in finding Botrychiums. The top photograph is taken from about five feet above the ground, the second photograph from about three feet above the ground. 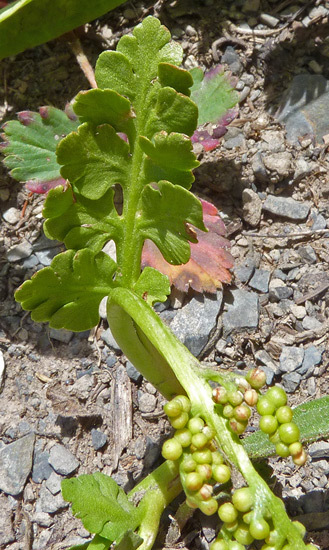 The Botrychium pinnatum in the close-up photographs below show the rewarding beauty of finding Botrychium. 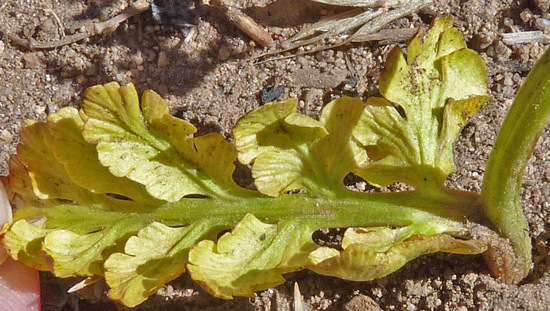 The yellowing Botrychium in the final photographs is the same plant shown in the center of each of the above photographs. The key to finding Botrychium is to retrain your eyes and brain so that you look at the bare spots between vegetation. Don't get distracted by the flowers and grasses. El Diente Trail, August 10, 2011. 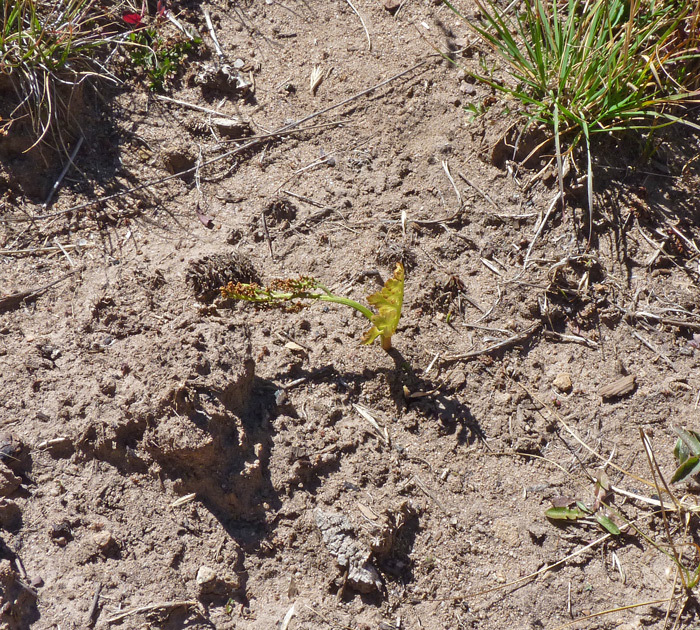 The B. pinnatum lying at a steep angle to the left has withered at its base and will soon die. The upright plant is thriving. The photographs immediately above and to the left show mature Botrychium pinnatum with the trophophore (the leafy portion of Botrychiums) fully open and the sporophore near full development. Botrychium pinnatum basal pinnae (leaflets) are broadest at the bottom and often, as shown here, deeply lobed on both the upper and lower margins. Upper pinnae are usually very slightly or not lobed and they are narrower than the lower pinnae. The stalk of the Botrychium pinnatum trophophore is 0-2 millimeters long, the sporophore stalk is much longer, and the common stalk that supports the plant from the ground upward may be from 9-25 millimeters long. 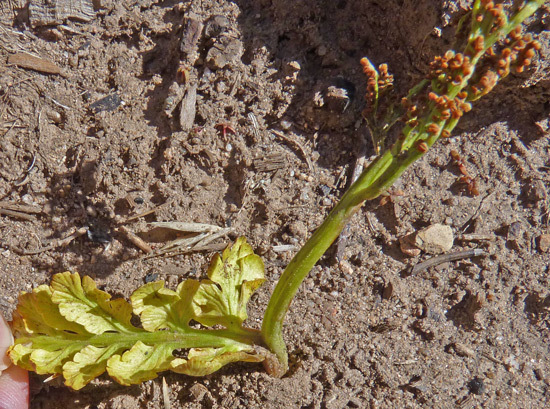 Botrychium pinnatum is classified as a rare plant in the Four Corners area but we find it on many of our mountain hikes. Click to read Don Farrar's page on B. pinnatum. 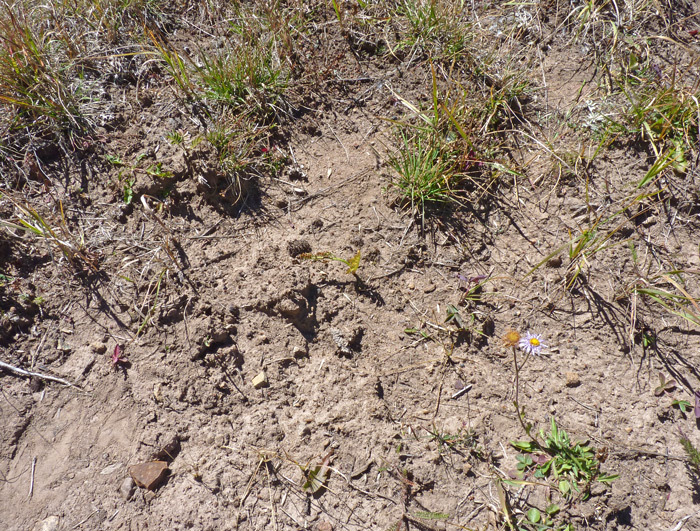 The two photographs at left show Botrychium pinnatum late in the season. The photograph immediately above these shows the plant at its most robust stage. 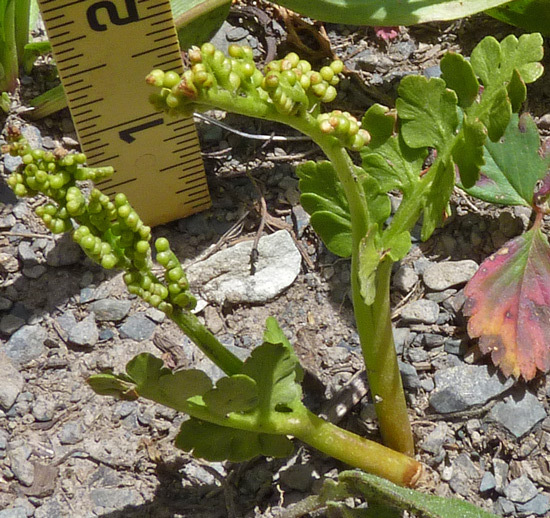 With some perseverance, one can find various Botrychium over a period of at least three months.